Brad has been experimenting with mixing Plastimake and different types of glitter, with some great results! 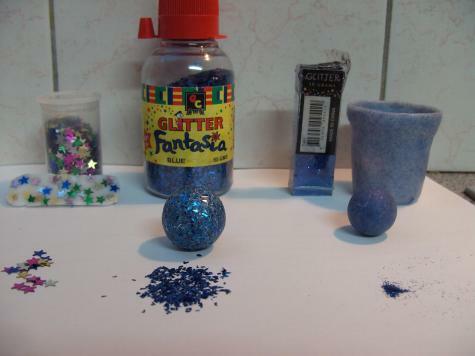 The blue pot and ball on the right is coloured by fine glitter. The larger ball in the middle has a large in it and it was reheated to be sticky and rolled in the larger glitter. The small panel on the left had stars sprinkled on top before it was set. We're really impressed by Brad's efforts. The fine glitter seems to produce a particularly interesting effect, we're going to keep this idea in mind for future projects.